Students from across LSBU helped to connect two of the largest global cities this summer, using a virtual portal created as part of a student-led creative technology project. Working with students from Ryerson University in Toronto, the two institutions were joined across the Atlantic via an on-street virtual portal that captured live movements in one city and then responded with a visual interpretation in the other. As a result, a dance or a wave in London could be seen in lights 3,500 miles away in the centre of Toronto. The Portal was simultaneously unveiled by the two universities – which had been partnering for more than a year through the School of Arts and Creative Industries at LSBU and the Faculty of Communication and Design at Ryerson – in May. In order to take part in this innovative opportunity, students had to compete to create the portal by submitting their own design in groups to fulfil the brief to connect London and Toronto in a way that represents communication, cultural identity and diversity. A final group of nine chosen students from both universities, covering disciplines including engineering, design, arts, media and business, worked on the end design. The public were then invited to interact with the live portal, which was based at the Clarence Centre for Enterprise and Innovation, from the end of May until July. 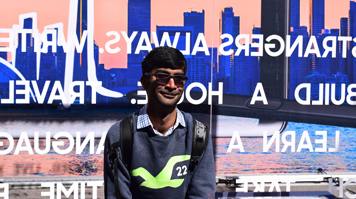 Second year BSc (Hons) Data Science student Kishan Patel was one of the successful students selected to take part in the project, and he says that the opportunity to do something completely different was what appealed to him. Kishan’s team’s design involved creating a window panel that contained LEDs, was able to track movement from the outside and then show it in the window to people watching. The judges found this to be an exciting concept and so Kishan was selected to become involved. As expected, there were challenges along the way, but he says it was definitely worth it. As a reward for the hard work and dedication on the project, Kishan and another member of the team, Photography student Claudia, where invited to Ryerson and spent a week with the team they had worked with 3500 miles away. With his involvement in the project now over and Kishan returning to his studies, how does he feel about it and what does he think he gained?